Named one of Entertainment Weekly's 2014 "14 Reads That Are Worth The Wait" and called "a mesmerizing modern portrait of teenage life today" by Gillian Flynn, THE FEVER has received rave reviews from Booklist ("a powerful portrait of community, with interesting echoes of The Crucible"), Publishers Weekly ("thrilling...gripping...razor-sharp"), and Kirkus ("stunning"). 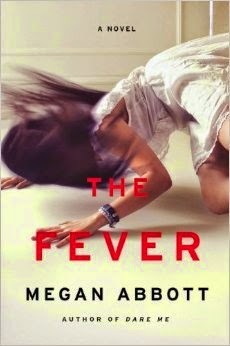 Loosely inspired by the nationally reported story of the purported "mass hysteria" outbreak in Le Roy, NY in 2012, THE FEVER is a haunting, thought-provoking page-turner that examines the powers of desire, guilt, secrets, and fear. It's at once entrancing and disturbing, and readers will not be able to put it down until the very last page. Megan Abbott wrote one of the most memorable and beloved books of 2012. Called "deft, intelligent, and enthralling" by Kate Atkinson and "spectacular" by Chelsea Cain in the New York Times Book Review, her novel Dare Me--a chilling story of backstabbing cheerleaders and adolescent rivalries--was nominated for Anthony and Steel Dagger awards, was Gillian Flynn's Holiday Book Picks selection for NBC's Today show, and made many Best Books of 2012 lists. This book sounds very interesting with an outbreak and secrets that are coming out from family, friends, and even the town. It sounds so mysteriously. I have really been looking forward to reading this one. It sounds fantastic and I know Abbott is really dark! Sounds good, would love to read it. This sounds so good! Thanks for the giveaway! I've already heard so many good things about The Fever that I'm very pleased to have the chance to win a copy. Thanks. I have been crushing on this cover! This book really looks like a fast paced intriguing story. Thanks for opportunity to win. This book sounds absolutely riveting!!! This book sounds so intriguing!!! I've been looking forward to this book! Thanks for the giveaway. I've heard so many positive things about THE FEVER that I can hardly wait to read it! I dig Megan's noir (e.g., QUEENPIN) and really enjoyed DARE ME, so this newest release has been on my TBR list for some time. I just finished a great series & need something new. This sounds like my kind of book. It would be great to win.it. Thanks for the chance. Sounds awesome & I've been waiting to read. Glad it's getting praise.